British tennis player Dan Evans, previously seen making logistically complex excuses for trace amounts of cocaine, is now trying to qualify for the Australian Open main draw. The world No. 190 faced world No. 208 Jurij Rodionov in the second round of qualifying today. 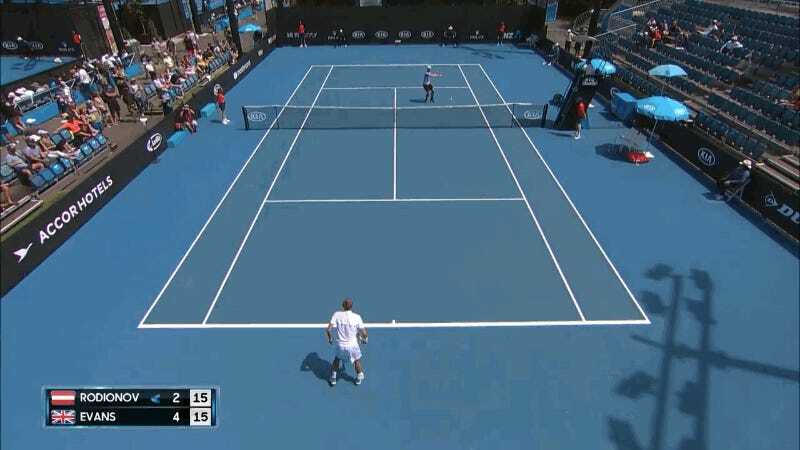 All you need to know about that match is that in the first set, Evans overran a forehand by Rodionov and seemed totally beat—only to whirl into a nearly blind flick of a passing shot, which somehow worked. It’s one thing to stab at that that kind of ball and make glancing contact; it’s another to hit it really hard right into the open part of the court. Evans won 6-4, 3-6, 7-5, and is now one win away from a spot at the year’s first major.